Nobel laureate Muhammad Yunus in an open letter to the people yesterday asked for views on his plan to float a political party to establish political goodwill, proper leadership and good governance and build a new Bangladesh. He observed that the current political climate seeks to destroy the potential of the country and so without a comprehensive change there, it would never be possible to take the nation "to the height it deserves." In the letter, he called on everyone to briefly outline how he should go about the task and how they can contribute to it. "If they say 'go ahead', I'll join politics...form a party," he told reporters at Zia International Airport (ZIA) minutes before flying to Kolkata to receive 'Shera Bangali 2006' [Best Bangali] award. This is his second trip to India in little over a week. Yunus has been elected the best Bangali of 2006 by the people of West Bengal and the Bangali community across India through SMS votes. ETV Bangla of Kolkata will confer the honour on Prof Yunus at a reception today in the Science City Auditorium in Kolkata. 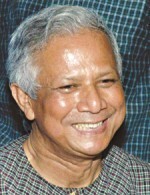 Known throughout the globe as the banker to the poor, Yunus made it clear that he would not proceed if his letter fails to draw strong feedback from the countrymen. Addressed to every individual, the letter was circulated among the reporters who went to the ZIA to cover his departure for the neighbouring country. "The way the present caretaker government is carrying out reforms necessary to create an acceptable atmosphere has made me optimistic along with all citizens of the country," it reads. He said he knows joining politics could leave him controversial. Still, he is ready to take the risk if the people reckon that his coming into politics would help usher in a new political climate. The microcredit pioneer said he thinks it is high time to get rid of all past frustrations and form a proper political structure conducive to "building the Bangladesh we all dream of". The winner of Nobel Peace Prize 2006 said he needs active participation and support of the people from all walks of life to move ahead with his mission. "The effort of you and me to achieve everybody's desire for a new politics in order to build a new Bangladesh will gain strength if these can be learnt from you in the form of a letter," he continued. Yunus noted that the people of the country could make anything that seems impossible possible with their innate endeavour and creativity given that a qualified leadership, a goodwill and good governance are in place. It won't be possible to come out of the old politics if a strong momentum for a new one is not created, he wrote in the letter. "We will not be able to reach our goal with feeble support." He sought personal reply detailing how the party could work to realise the popular expectations, have on board the honest and competent ones, and ensure democracy and transparency within the organisation, and so on. He urged all to respond through letters, emails or SMS. Talking to the reporters, he said he never thought he would join politics, he was rather looking forward to an election with participation of all the political parties. It would be pointless to have into the fold those who have long been perverting the political landscape, he said adding, "There must be a sharp distinction so that the new politics could really be new." Asked if he is sure of his success, Dr Yunus said, "I cannot guarantee failure or success. It cannot be said for sure in the case of politics." He said an opportunity is there and so he is giving it a try. "Otherwise, I might not have a chance to console myself. Now I can say that at least I tried." On the next election, he said: "There is no hurry. I may take part in the polls only if by that time my work of forming the party is over and done with."